Back to fun after the holidays. This is Curley Maple with a one piece Walnut top. The bevel is 14 degrees and the mitre is 43 degrees. The top was a 1+3/4 inch piece of walnut. The cuts empowered all made with a certain order of cut coordination. Sorry for sounding like a geek there. But I am at heart with math and science. The under handle cuts are bigger than the top. The top has some weight to it, but it’s a design I liked when I was finished with the cuts. That went right in to my favorites. Wood combo is great. Well done! I realy like those various angles and curves on top. This is a nice looking wine case. 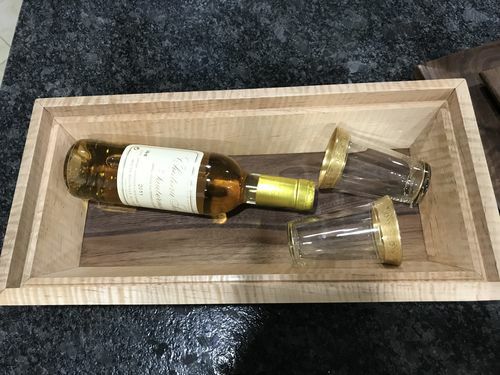 thats just gorgeous.i love the wood combo and the angles you used give the box a nice look.you did a beautiful job. Angles!! Too many angles. Haha. I’m not anywhere close in my woodworking to try angles like that. 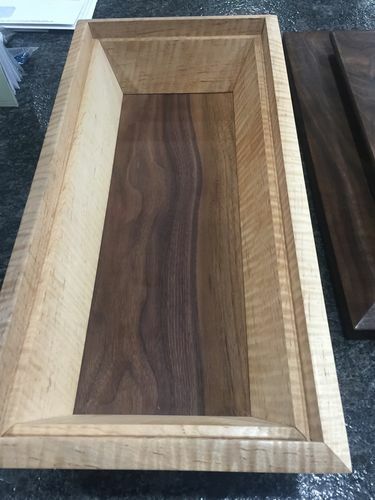 The box is beautiful (wood and design) but you did a great job bringing the angles together. I’m impressed. Turned out well! I’d like to se the inside..
Here’s the inside. 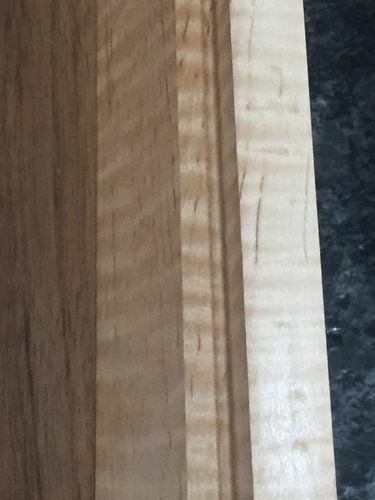 The bottom is 1/4 walnut floating in a groove. The groove is the same angle as the bevel. That way it is horizontal when the box is put together. The top inset is again at the same bevel so it is perpendicular to the bottom. I make the vertical cut a little deeper to give a nice inside detail for when the top is off.